This book reveals the exciting new discoveries of the Bibles hidden numbers that will transport you from our foundations in creation into the magnificent future that has been planned for man on planet earth. The amazing relationship of the Book of Revelation to the first chapter of Genesis reveals a magnificent plan that was ordered from the beginning, and has progressed precisely on schedule through a circle of seven thousand years. The future of man has its roots in Genesis One. *Discover the awesome relationship of the very special numbers: 3 and 7 *Discover the curious relationship between the Book of Revelations and Genesis *Learn how the secret code of Gematria is built into the Bible Chapters include: Science, Physics and the Bible; The Formula for Creation; Spreading out the Earth; Truth is Eternal; Go in a Circle; John, and Circle of Time; John Completes the Circle; The Divine Utterances; The Last Adam; The Miracles of Growth; Birthing the Universe. 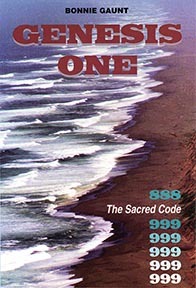 GENESIS ONE: The Sacred Code of Creation, by Bonnie Gaunt. 204 pages. 5x9 Paperback. Illustrated, maps, and references.